Radiographic study of physical growth in children. T. Wingate Todd, Western Reserve University. 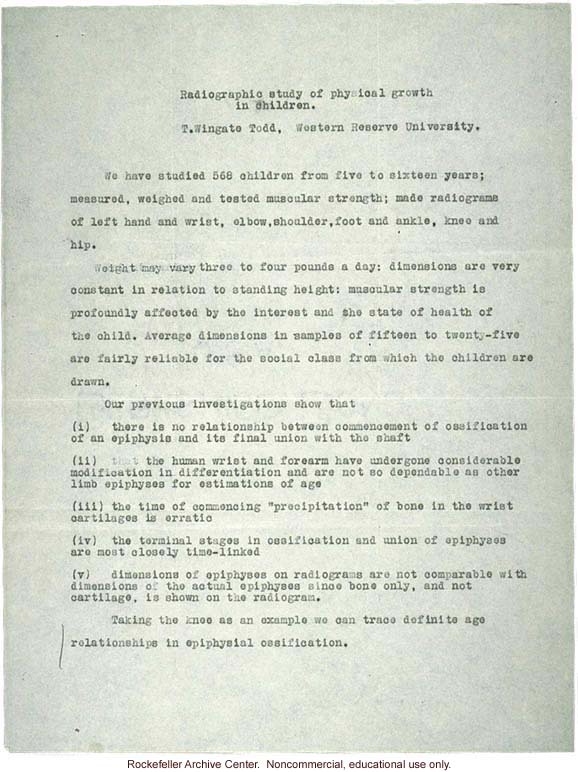 We have studied 568 children from five to sixteen years; measured, weighed and tested muscular strength; made radiograms of left hand and wrist, elbow, shoulder, foot ad ankle, knee and hip. Weight may vary three to four pounds a day: dimensions are very constant in relation to standing height: muscular strength is profoundly affected by the interest and the state of health of the child. Average dimensions in samples of fifteen to twenty-five are fairly reliable for the social class from which the children are drawn. Our previous investigations show that (i) there is no relationship between commencement of ossification of an epiphysis and its final union with the shaft (ii) that the human wrist and forearm have undergone considerable modification in differentiation and are not so dependable as other limb epiphyses for estimation of age (iii) the time of commencing "precipitation" of bone in the wrist cartilages is erratic (iv) the terminal stages in ossification and union of epiphyses are most closely time-linked (v) dimensions of epiphyses on radiograms are not comparable with dimensions of the actual epiphyses since bone only, and not cartilage, is shown on the radiogram. Taking the knee as an example we can trace definite age relationships in epiphysial ossification.